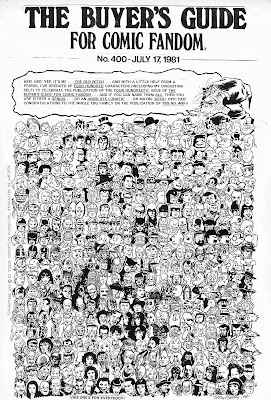 Scary Terry's World: 400 faces! I've been sorting through my original art files, finding pieces to list for sale on my website, and thought it'd be fun to show some of what I'm sorting through here, and tell the story behind them -- some that I'm listing for sale, and some that I'm not. Early in my career, I was a regular contributor to Alan Light's The Buyer's Guide for Comic Fandom, a weekly tabloid format fanzine, which consisted mostly of buy/sell/trade ads for comics and related collectibles -- but it did have regular columns (I wrote one for a while), articles, interviews and cover illustrations. Most of the cover art was contributed by fans looking to get some exposure -- with a pro cartoonist cover in the mix once in a while (even Milt Caniff got involved). But the weekly schedule left Alan needing more cover art than he was getting for free -- so I was hired as the semi-regular cover artist. As far as I know, I'm the only artist who was ever paid to draw covers for TBG. I used the opportunity to pay tribute to cartoonists I admired -- and to experiment a bit (we did a 3-D cover!) -- and to just plain have fun -- which is what I was doing here. This is TBG #400, from July of 1981. To celebrate reaching the 400 mark, I decided to challenge myself to draw 400 characters on the cover. 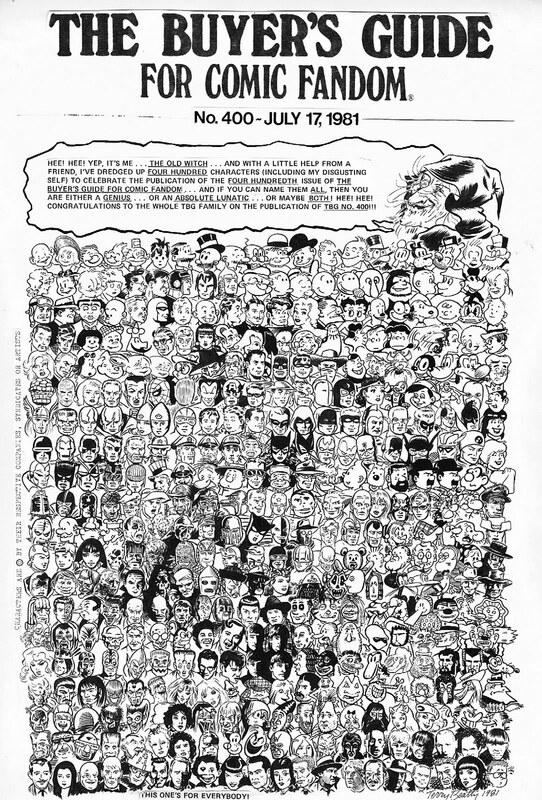 I marked off a grid of 400 squares and started with comic strip characters, then moved on to Golden and Silver Age super heroes and on through the underground comix and ended up with my own characters (and me!) -- with some faces from the movies, TV and the music scene thrown in for good measure. If you can name them ALL, you are a true pop culture fiend! Click on the image to see it bigger. Is...Is that one of the guys from Devo net to J.R. "Bob" Dobbs? Who is that Ms. Tree-ish character above the Shadow? Ian: Yes to Devo (it's Mark Mothersbaugh) -- and that's Milt Caniff's Miss Lace above the Shadow (and near Steve Canyon and the Terry and the Pirates characters). It's all lines on paper.